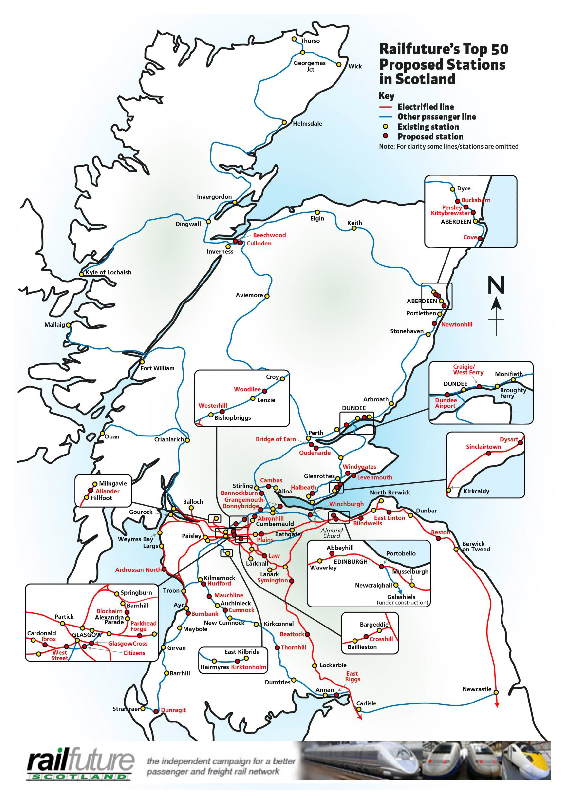 On Saturday 15h November 2014 at a public meeting Railfuture Scotland announced its suggestions for the expansion of the Scottish rail network to improve the competitiveness of Scotland and help to achieve a sustainable society. These ambitious, but carefully thought out, plans were publicised with a press release in mid-November 2014. Key to the Railfuture Scotland proposals were 50 stations to be opened or roepened. This map shows their location. Click on the image to expand it. The 50 stations shown on the map all lie on existing or government proposed rail lines and are those assessed to provide the greatest immediate benefits. Most can be served by existing services. To see the names of the stations click on Top 50 Stations (PDF 700 kB). Railfuture Scotland has also produced a spreadsheet of 44 other possible stations, which shows the council areas, RTP ares and current local population. Figures from the spreadsheet can be provided on request. The Railfuture Scotland proposals cover upgrades to existing lines, pormarily line-speed increases and electrification rolled out across more of the network. Click Electrification Flier for a one-page campaigning flier produced by Railfuture Scotland, which calls for the promised electrification to be double its proposed rate of electrification (to 200 track km per annum) and for more of the rail network in Scotland to be electrified. The frequency of services on existing rail routes need to be increased to meet target service levels. Click Target Service Level Flier for a one-page campaigning flier produced by Railfuture Scotland, which calls for 15-, 30- and 60-minute train frequencies for different types of journeys in Scotland. To allow more frequent services it will be necessary to improve the network, both signalling and doubling (often reinstating what was removed) track. Click Other Route Improvements for a one-page campaigning flier produced by Railfuture Scotland, which calls for infrastructure improvements on some specific railway lines in Scotland. Rail passengers must have adequate facitilies whilst waiting for their train to arrive and travel in comfort on the train. Click Appropriate Facilities for Passengers for a one-page campaigning flier produced by Railfuture Scotland, which sets the acceptable standards for stations and the on-board experience, whether in Scotland or anywhere else in Great Britain. Passengers, and prospective rail users, must be able to easily find out information about the rail services available, and their train in particular, and the information must be accurate. Click Appropriate Information for Passengers for a one-page campaigning flier produced by Railfuture Scotland, which calls for high-quality reliable information at stations, on board trains and, of course, on all online services. Railways are cleaner, quieter, more energy efficient, potentially faster, safer and more environmentally friendly than other means of transport for a wide range of journeys. In Scotland we are now falling far behind many advanced countries in Europe because of our lack of investment in railways. The result is increased road congestion causing a loss of competitiveness, loss of opportunities, increased danger to citizens and increased pollution. We cannot solve these problems by building more and bigger roads. The government now accepts that building new roads generates new traffic, which fills up the new roads very quickly. This means the same problems often exist soon after opening, on a larger scale, than before the new road was opened. This is best illustrated by the fact that, three years after it opened, traffic on parts of the Edinburgh bypass had reached the levels forecast after thirty years. The congestion on this relatively new road is now so great that there is talk of widening it. The NPPG on Land Use and Planning from The Scottish Office, which was published sime years ago, made it clear that we cannot go on building large scale new roads as we have been. Fortunately there is a solution to these problems and a major part of the solution is the railways. Railfuture advocates reducing the level of spending on new roads in Scotland dramatically. This money is not solving traffic problems, it is just moving the problems around. The money saved would be invested in alternatives to roads, including the railways. The Bathgate line is an example of this sort of investment and it has exceeded the expectations of those who planned it. This leaflet outlines some desirable schemes for passengers and freight. Many are planned in detail and we can put you in touch with someone who will outline the scheme. The significance of these schemes is that nearly all have been actively promoted by the rail industry, often in conjunction with Local Authorities, as desirable for the achievement of a comprehensive and efficient railway system, allowing the railways to exploit their social, economic, environmental, energy and land-use advantages over many other forms of travel, by carrying more passengers and freight. Railfuture is the only independent body that represents the views of rail users, and potential rail users. It is free of the influence of political parties, trade unions, railway management, local and national government. For more information on the campaigns listed on this page please contact the Railfuture Scotland Secretary, Jane Ann Liston. Details (email, phone and postal address) are on the contacts page. To join Railfuture now for a modest annual membership fee, pay online now (using your debit card, credit card, or PayPal account) at www.railfuture.org.uk/join. For rail new from the whole of Great Britain go to www.railfuture.org.uk.